Can you work together as a team to construct and build a raft that will float on our lake and keep you dry. We will provide you with a number of barrels, planks and ropes to construct your vessel and after a short brief from our raft building experts you are then on your own to discuss and construct your masterpiece. Work as a team, whilst learning valuable rope skills before taking it to the water. Will you end up in the water, or will your team stay dry? Before any rafts are allowed on the water, they are tested by qualified instructors who ensure the safety of the construction. Teams will have the opportunity to ask questions throughout this activity, or use their own ideas and experience to ensure that every session is tailored to suit the experience and requirements of the group. Once out on the water, groups will need to carry out various tasks, or just paddle around and explore the lake setting. 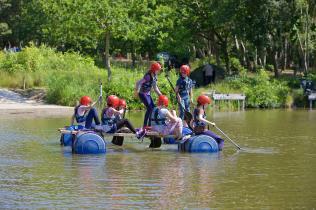 For groups booking more than one group on raft building it can also be possible to build a fun competitive element into this activity. Groups running at one time: Multiple sessions can be booked at one time. Minimum group size 4. Extras: All safety equipment is provided for this activity. Fun: A great outdoor adventure activity that can be tailored to suit the nature of your group and your specific learning objectives. Skill: Offering a balance of physical activity and problem solving / team building skills, including communication, knot tying and design, Raft Building helps support the development of skill acquisition. All rafts are fully checked before being allowed on the water to ensure safety and foster a sense of achievement. Support & Cohesion: Particularly useful for new or emerging groups, this activity supports the development of self-belief and can improve group and leader familiarisation as individuals work closely together, exploring and sharing ideas, designs and personal strengths where everyone has the opportunity to support each other and shine. As teams design and build their raft they need good levels of communication and cooperation and can explore leadership styles / roles. When incorporated as part of a development programme of activities individuals will be able to recognise their own achievements and individual progression, as well as have the opportunity to develop personal qualities such as; self-reliance, perseverance and an appreciation of the benefits of the outdoors for wellbeing and fitness. As well as being adapted to suit your group and their specific learning objectives, Raft Building can support key areas of the curriculum.